Attendees commemorate civil rights movement and demand more social justice in the US. 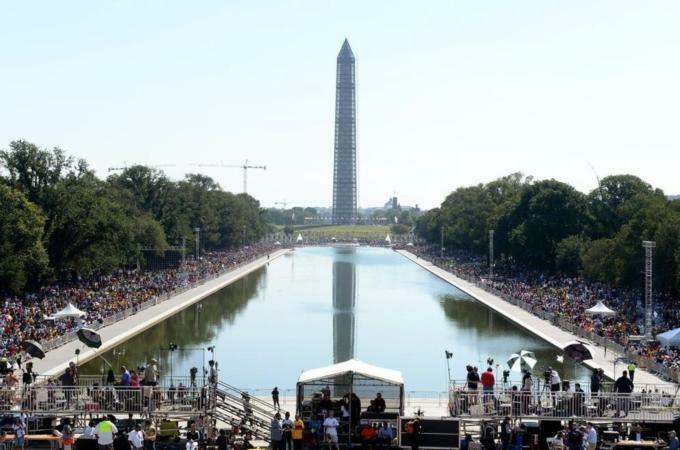 The tens of thousands of people who converged in front of the Lincoln Memorial on Saturday morning were commemorating a different speech – King Jr’s iconic “I Have a Dream” speech during the March on Washington the same year – but the theme for the five-hour-long “Realize the Dream” rally and march was largely the unfinished business of the civil rights movement. The event was organised by the National Action Network, a civil rights group founded by the Reverend Al Sharpton. In the most striking evocation of that sentiment, the family of Emmett Till, the 14-year-old black teenager shot in the head in 1955 in Mississippi after he was accused of flirting with a white woman, spoke in the closing minutes of the rally, urging attendees to march for justice. Immediately after, the mother of Trayvon Martin, the unarmed Florida teenager who was gunned down, took the podium. There appeared to be as many buttons, T-shirts, and signs bearing the likeness of Martin, in a hooded sweatshirt, as there were of King Jr marchers lined the length of the reflecting pool, from the steps of the Lincoln Memorial, all the way to the World War II memorial, almost a mile away. Fifty years ago, Myrlie Evers was inside the house with her three young children when her husband, prominent civil rights activist Medgar Evers, was gunned down in his driveway by a member of the Ku Klux Klan. On Saturday, she told the crowd that “Stand Your Ground” – the controversial self-defense gun laws – needed to be a rallying cry for various social justice issues. Fifty years ago, John Lewis, a 23-year-old activist with the Student Nonviolent Coordinating Committee, was the youngest speaker at the March on Washington, and re-wrote his address multiple times to avoid being too incendiary. On Saturday, he addressed the crowd as a congressman from Georgia, one of 43 black legislators in the House of Representatives, and saved particular outrage for the Supreme Court’s recent decision to strike down a provision of the Voting Rights Act. Fifty years ago, Bayard Rustin, instrumental in organising the march and a gay, black man, was widely considered an outcast in the civil rights movement. On Saturday, a rainbow pride flag flew above the reflecting pool. Eric Holder, the first African American attorney general, used his time at the podium to pay homage to the untold millions who worked for civil rights and went unacknowledged, from freedom riders to women and LGBT activists. “For them, I would not be attorney general of the United States and Barack Obama would not be president of the United States,” he said. The list of grievances discussed by speakers, the large majority of whom were associated with progressive causes, was long and included an unemployment rate higher in 2013 than it was in 1963, the plight of low-wage workers, “a war on the poor masquerading as a war on drugs“, efforts in various states to impose restrictions on voting, fewer dollars flowing to public education, gun violence, and law enforcement techniques that disproportionately affect African Americans, such as New York City’s stop-and-frisk policy. Several implored the younger generation to get as engaged in today’s social causes as their parents had been in civil rights. “Our eyes are opening,” she added. Patrick Robinson, 41, and Shavon Beans, 32, brought their eight-year-old son, Brent, to the rally so he would understand the history of how far black Americans had come, and all the things that they believed were working against him. You were with Dr. King days before he was assassinated. What did you guys talk about? America. The last time I saw him was in my home. He was in a zone of discomfort. He said: ”We fought long and hard for our cause, and shall prevail, but I really get the sense that we may be integrating into a burning house. The question for me is whether or not we can be firemen.” That prophetic thought wasn’t as well understood as it is now.